A con man, posing as a bank employee, duped a jawan of the Indo-Tibetan Border Police (ITBP) and fled with Rs 2.5 lakh here today. The incident took place here this afternoon when the jawan, Jaiveer, posted at the ITBP cantonment at Baddowal, visited the main branch of the State Bank of India at Fountain Chowk. The transformer at the sewage treatment plant at Bhattian remained out of order for the third consecutive day today. It took three days for officials of the Sewerage Board to find the fault. By the time the fault was found, sewage had already accumulated in some areas falling in ward numbers 1 to 15. To recover pending road tax from bus operators, a special drive was initiated by the District Transport Department today. Operators of stage carriage buses have been asked to deposit their pending dues with the department, failing which their buses will be impounded and heavy penalty will be levied. Clearing one road a day seems to be the new mantra for Mayor Harcharan Singh Gohalwaria. Sending a clear signal to encroachers, the Mayor spearheaded an anti-encroachment drive in the Jawahar Nagar Camp and Jaimal Road areas of the city this evening. 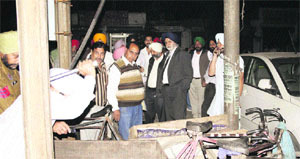 It was after several years that the city Mayor took an active part in an anti-encroachment drive. Four policemen have been sent to the Police Lines for creating a ruckus and picking a fight with each other on a petty issue. The wives and children of these policemen were also injured in the fight. After dilly-dallying over the issue for two days, the city police finally imposed one-way traffic restriction on Ferozepur Road here today. 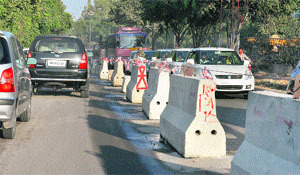 The traffic regulations have been imposed due to the construction of an expressway and an underpass on Ferozepur Road. 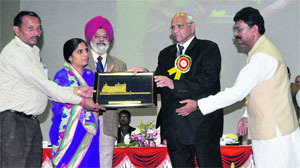 The three-day 7th National Conference of Krishi Vigyan Kendras -2012 commenced at Punjab Agricultural University today. The conference is based on the theme, "Integrating Technologies and Best Practices." Kendiya Vigyan Kendra (KVK), Babhaleshwar, was awarded the best KVK for farming during the 7th National Conference of KVKs-2012 at Punjab Agricultural University today. The KVKs at the zonal level were also been awarded. The KVKs from Kaithal, Ninpeeth, West Tripura, Saharanpur, Durgapur (Amravati), Anta, Jhabua and Kozhikode were awarded at the zonal level in zone 1 to 8 respectively. Two women farmers received the award of Champion Women Farmers during the 7th National Conference of KVKs-2012 at Punjab Agricultural University. Karamjeet Kaur Danewalia from Fazilka and Krishna Yadav from Delhi have become success stories for their exemplary work as farmers. Farmer Krishna Yadav receives the Champion Woman Farmer award from Union Minister Sharad Pawar. An exhibition was organised at the PAU on the occasion of the 7th National Conference of KVKs held at the university. More than 50 KVKs and NGOs exhibited their products and agricultural innovations at the exhibition. About 150 differently abled students (deaf and dumb) from about 12 states of India have gathered here to show that they are worth or even better than lakhs of their normal fellow-beings, by showing their talented side. They are part of the team to participate in the 2nd All India Deaf Art and Craft Festival, organised by the All India Deaf Art and Cultural Society, New Delhi. Young Indians Ludhiana Chapter in association with Delhi Public School organised a learning session for the school students of Class IX to XI on "Choosing IT as a Career" at their school premises. The objective of the session was to enlighten students about various avenues that IT provides in India and abroad and how students can become successful entrepreneur choosing IT as a career option. There were around 100 students who attended the session along with the school staff. Speakers present on the occasion shared their experiences with the students of DPS, Ludhiana. As many as 171 patients were examined during a mega health check-up camp organised here at Community Health Centre, Sahnewal, under Rashtriya Swasthya Beema Yojna (RSBY). Ludhiana: Daniel Peter Othol, Ambassador of South Sudan to India visited PCTE Group of Institutes here on Tuesday where over 11 South Sudan students have been studying in various undergraduate courses. Othol said there were many opportunities in South Sudan for Sudanese students to study and bring home to their own country or as trade between India and South Sudan. Merely a few days after the bloody property dispute that led to the death of country's leading businessman Ponty Chadha and his brother Hardeep Singh, another property dispute, involving an Inspector of the Punjab Police, has come to light here today. Five persons, including a woman, have been booked on a charge of kidnapping a 19-year- old girl. The city police has arrested three persons, Parvinder, Rakesh and Prince Kumar, following a raid near the Tajpur area here today. Their accomplices Vinay and Chitra Sharma, however, managed to escape. Two-day district Ludhiana throw ball championship concluded at Everest Public Senior Secondary School here today. Twentytwo teams from the district participated in the championship. Everest School won maximum prizes in the tournament.